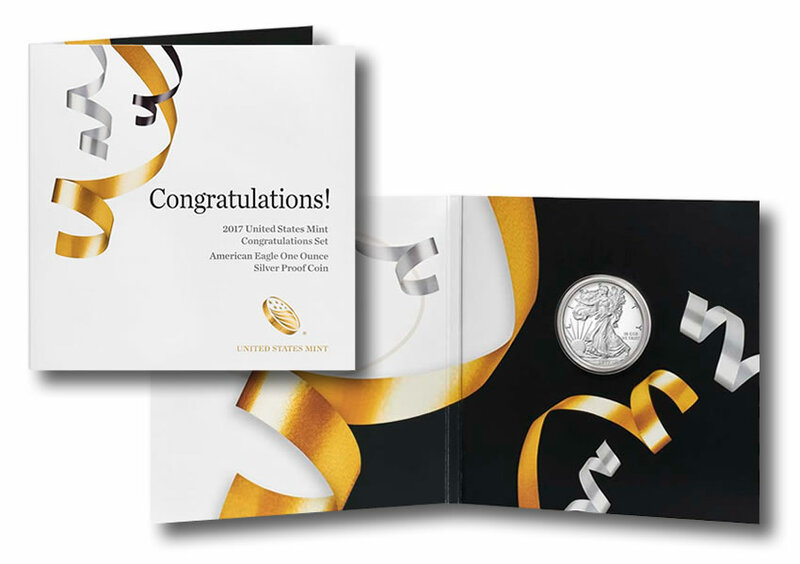 The U.S. Mint widened the appeal for this year’s Congratulations Set, pulling coin collectors into the fold of wanting one not just for gift-giving but also for themselves. The 2017 Congratulations Set’s folder is congratulatory-themed with silver and gold ribbons. The special “S” Mint proof Silver Eagle is encapsulated inside on the right with the left fold having an area to write a personalized message. A certificate of authenticity is printed on the back of the folder, while coin specifications appear on the back of a protective sleeve that wraps around the folder. 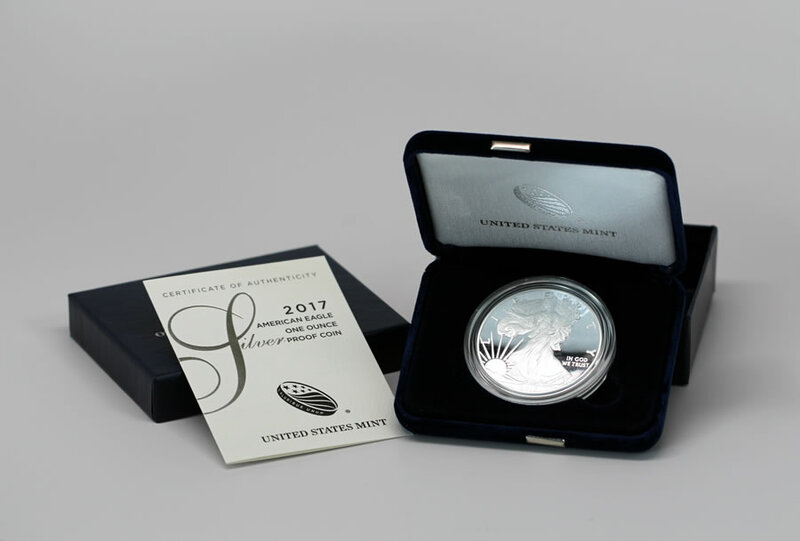 Produced annually since 2013, the sets have — until now — always included the year’s standard proof American Silver Eagle. This year’s set includes a special one that’ll have a lower mintage. Coin collectors will want one for that reason alone, and more will buy just to maintain a full run of Silver Eagles by year. Congratulations Sets had always featured the years proof Silver Eagle from West Point, bearing the facility’s "W" mint mark. In a compelling change, the 2017 set has a proof Silver Eagle from the San Francisco Mint with an "S" mint mark. The latest available U.S. Mint sales figures have last year’s made-to-order Congratulations Set at just 2,374. The debuting set from 2013 ended with the highest sales at 18,347. This year’s set should top those easily because of the "S" Proof Silver Eagle, although its maximum is established at 75,000. The U.S. Mint also said that the 2017-S Proof American Silver Eagle will be available as a part of the 2017 Limited Edition Silver Proof Set. Its limit hasn’t been announced but last year’s set has sales of 39,166 with 50,000 possible. Minimally, it looks like there will be at least 125,000 "S" Proof Silver Eagles available. Released today at noon ET for $54.95, buy the 2017 Congratulations Set directly from the United States Mint right here, or call 1-800-USA-MINT (872-6468). There is no household order limit. Update (April 5): The U.S. Mint on April 5 at 10:08 a.m. ET sent news editors the following notice about the set’s status: "Sales attrition from cancellations, returns and credit card declinations could result in a very limited quantity being made available for sale." joe#2 – You are right about that! Check your 2016 American Liberty Silver medals and your 2014 high relief kennedys. Mine have milk spots. I guess technology has not improved since the 1960s. Michael Angiolillo, Correct. Also my Royal Canadian wildlife series have the same issues. Nice coin mind you, But didn’t want to spend $60 (w/ shipping ) to have the same issues. I’m surprised that so many people feel like they were not given adiquate notice/opportunity I saw this product discussed here as well a Coin World, Coin Week, Mint New Blog and on the Mint website. Perhaps they will offer it as an individual item later this year in addition to the silver set. We are in for a few more surprises this year. I do not ever recall being connected via telephone to any foreign or alien representative stationed on the phone lines for the past ten years or more. If any have, please state that here. You’re absolutely right. God bless you and God bless America! We talked about the Maryland location which I’m aware of. Actually, that is how I started ordering coins from the U.S. Mint. I know nothing of the outsourcing but it stands to reason that every penny counts, in that many amount to millions. 2017 Congratulations Set was a small window; some saying 120 seconds, varying to 3 1/2 minutes. Would you know how I can determine when my order was placed (Time) seeing that it was the fastest sellout > ‘I was interested in knowing, if at all possible. Sorry, in my post I said yesterday but I meant to say two days ago(4/4). Just an FYI for everyone, the Mints web site worked flawlessly for me. Even the check out process was smooth as silk. All I needed to do was add my security code from my CC and BAM, I was finished. You are definitely right that the US Mint has never outsourced its call center to any foreign country, but their used to be a US government call center in Lanham, Maryland with Federal USA government employees answering the phone. The Mint outsourced its call center & fulfillment center warehouse operations to private vendor companies in the 1990s (both contracts are currently held by PFSweb Corp.) But the Mint does purchase packaging from Asian countries & some blank planchets from Australia. Some early folder-type sets were also printed in the United Kingdom & state so on the back of the folders at the bottom. The Mint also had its US Mint logo tote bags made by a company in Vietnam just a few years ago, which caused outrage among many Vietnam Veterans who were Mint customers at the time. The Mint is fully globally-integrated as such. Our paths must have crossed at some time in the numerous numismatic blog websites like coinworld.com. If you didn’t place your order by computer, (which would have the date & time stamp on your online order confirmation) & you called in the order, you can call back & ask the rep to read the exact time your order was accepted by their order-taking computer system. Or you can go to the Mint’s website & scroll down & press on “Live chat available” section that will initiate a online text conversation with a rep & at the end of chat it gives you the option to have the entire chat session sent to your email inbox. Good luck. Thanks very much. I ordered online via PC; receiving the order next Wednesday, the 12th. Where do I see the date and time stamp, in my email confirmation or the U.S. Mint order section? Tried searching for it but must not be very adept at finding the time. I’ll look again. I noticed your post on Coinworld, thanks. *There are many irate, bitter people screaming. If one really looks at the entire scope of collecting, there should be no animosity toward the U.S. Mint. Not that I wish to delve upon principle but the U.S. Mint is far wiser than the lot of grumblers combined. Still waiting to hear where one might find that time stamp. Three days later and my order is still processing. Not everyone can sit on the phone or computer until the clock strikes noon. A no limit, low mintage release is a gift to speculators, not collectors. How do you equate a ‘no limit’ adjoined to “low mintage” in the same sense? Furthermore, why would “either”-“or” pertain to ‘speculators’ only? No limit number on orders, I think that is obvious from the thread. Pulling some kind of semantics argument is pretty lame but you think you’re a real genius. Faster than you’ll ever be. Wow! I’ve seen a lot of emotion here in the past couple of days. Coin collectors can be very passionate! I am neither angry nor upset that I didn’t get any, but immediately came to terms with the fact that I will never own one of these. Someone stated that you can get one later in the limited edition silver proof set. Though I can afford it, I will not be purchasing that set just to get the silver eagle. I also neither condone nor do I support the ‘flippers’, though I am sure I am in the minority, otherwise, they wouldn’t exist. I already thought the Mint’s price was high. Somebody once said, “a fool and his money are soon parted”. I have better things to do with mine and have moved on. I hope others can do the same and be happy! 4/10/17 Just called mint now my coins on back order. Ordered at 12:00 . Got order confirmation 12:01 on 4th Another confirmation​ on line at 12:04 . Did I miss something???? No answer to my question, when??? Some of the graded PCGS 70s are going for $190 to around $230. I’ll be watching those prices and see where they go. Up or down? Unfortunately, the price will go down as the Mint issues otter product options with this coin such as the LESPS later in the year. Sell now if you have an extra one. I sold one raw at $150. You are very correct in what you stated, and more exactly, in how you did it. Nice job! The Coin Vault is selling this set for $249.98. I wish everybody would not buy from any of these third party vendors. I think they are robbing the collectors! Old Mike from HSN was upset because he said he couldn’t get five sets for himself. But he had some for sale graded by ANACS for crazy money! He never mentioned that the US Mint was going to sale more “S” Proof Silver Eagles in the Limited Edition Silver Proof Set. What is he called by some? Mike “Sold Out Limited Edition” Mezack? I think Mike uses the phrase ” First Day Of Issue “. Who will sell me a set by the end of the month? I will pay 10% over cost! if you could get everything you wanted when you wanted . in the condition you wanted. collecting really wouldn’t be much fun.